Roanoke County is proud to offer daily leases for the Laurel Mountain Driver Training Center to outside law enforcement agencies. The Laurel Mountain Driver Training Center is a Virginia Department of Criminal Justice Services (DCJS) approved facility for training law enforcement officers in the proper and safe methods of handling of vehicles in a variety of road conditions. Originally built for use by Roanoke County, the 30-acre training center includes a paved roadway, skid pad, classroom, and garage for minor maintenance and repairs. 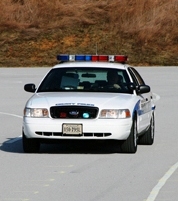 The Laurel Mountain Driver Training Center is managed by the Roanoke County Police Department. The center is the only training facility of its kind west of Richmond and is conveniently located just off Interstate 81 at Exit 132 in western Roanoke County.